36 year-old singer-songwriter, Martin Lee Renshaw hails from Wales but now lives in Watford. Having been actively performing since he was 15, #lobbylive was delighted to welcome him not once, but twice this year. I'm Kerry Lanigan, Creative & Education Outreach Manager for Watford Colosseum. I had the pleasure of interviewing Martin following his latest performance with Lucien's Library before Jools Holland last November. 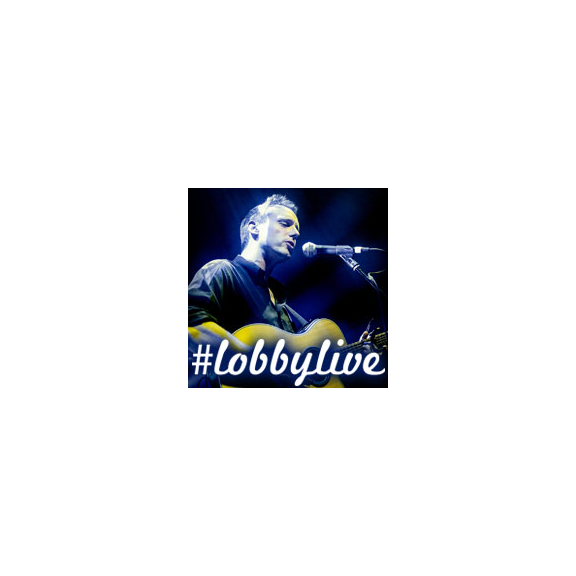 So Martin, you kicked off #lobbylive at the beginning of last year and came back to perform a second time. How did you find it? The first one – we were one of the first to play so it was a bit of a 'toe in the water'. This last one, the Jools one, it was really good, enjoyable, with lots of people. I think it's a really good opportunity for local artists. I'm really happy to be taking that opportunity, we're getting a whole load of audience we wouldn't normally be exposed to and they were really receptive and encouraging. You drew a good crowd into the Lobby at Jools Holland. How do you think your music went down? We tried to make it Jools appropriate, with the song choices and so on, it seemed to work well, we sold some cd’s and got some more facebook likes. Can you tell us a bit more about you, your music and your musical progression, how did it all begin? It began ages ago, I started playing when I was about 15 – some terrible, terrible music, really badly. Heavy metal, grungy-type stuff, I wanted to be Kurt Cobain but was so far off the mark. I really started playing properly when I was travelling around Australia at about 21. I discovered I could busk and make money and that was useful and good development, playing in front of people. Then I came back to Britain and came to Watford looking for work. I got a job at HMV where I met my best mate, Jim. Me and Jim have been making music for about 15 years, we wanted to be like Radiohead back then – we had this moody, epic, soundscape stuff going on. It was all very emotional. We then had Dizzie Cheroot and the Colossus Dream. It was kind of like a rap, reggae, funky thing – bit of a collective. Then we recorded the Phoenixdown album and after that it all kind of stopped... really when my little girl was born. So it's been like a journey through genres? Yes, and now I've done this latest album and it's something different again. I thought I'd quit music but then found cause to write loads more. I finished that (From the Ashes Album which you can listen to on soundcloud ) and now have Lucien's Library. What about collaborators and other Artists? You've mentioned Jim, who else are you working with now? I've found – with Lucien's Library – an incredible drummer called Simon Hadwin a funky jazzy drummer, who's by far my favourite drummer I've ever worked with. He's a real character and he gets the music in a way that nobody has before. Joining me on guitar and vocals - Jim Harrison, other Lucien’s Library Musicians are Mike Murphy from the Late Day Breakers on bass and Watford's brass section – they play with everybody – that's Jamie Andre, Simson Waitschulies. So there's a large cohort of musicians in Watford who work together? Yes absolutely, it's become a real melting pot, musicians contribute to numerous bands including: The Turner Brothers, The Late Day Breakers and the Spitfires. We all play in different formations on a regular basis and Lucien’s Library is the latest evolution. Being Welsh can you attribute your singing heritage to any sort of folklore upbringing? Well I can definitely attribute my mum and her karaoke machine with my aunt and Nanna, on a-daily basis, all the way through school. Nanna still sings – she posts herself on Facebook, singing in her living room! So there was a lot of singing in the family growing up, campfire style. I played the cello really badly at school, it was like sawing a dying beast. I played it for the last couple of years of primary school and the first of high school. It was basically a whole orchestra of horrible noises. Moving on from horrible noises – I've heard your music develop over the years. What would you call it currently? I don't know! The new one is quite upbeat – it's more upbeat than anything I’ve ever done. It's got a little bit of a funky, jazzy kind of thing going on, but slightly psychaedelic in the song-writing. It's a bit weird. We tend to mess around with arrangements to make them a little unexpected. Yes, I don't think I've ever done anything danceable before. It was all a bit miserable. So where are you at now? What's your next thing? Well, we're working on an album – Lucien's Library is the name of the album actually. We recorded it in July in a big, old library, in a house in Berkhamstead. The album is about a library of dreams and thoughts – a load of books that have been unwritten if you like, and looked after by the curator, Lucien. Each of the songs is as if part of a story has fallen out of the books. The music's finished – there's just a few finishing touches to be made. We have a load of new songs we've been rehearsing, so we'll also be playing songs that aren't on the new album! We want to play as many decent gigs this year as we can and get on the festival circuit. As I'm getting older, I'm starting to feel like this is less of a realistic career choice but I love it and I'm getting better at it! So it would be nice to think there is a future in some form. If people like it, then that's great isn't it? Do you still perform solo? Yes, lots. Predominantly that's what I do as I'm easier to manage than a bunch of guys that already play with loads of people! I play a lot in London – as many open mic nights as I can manage. I've done a lot of playing this year. I thought the challenge of playing as much as I can and becoming the best I can be on my own without needing a band to make my songs work. I've got a lot better this year as a result. Good question! I'm struggling to think! There was a really nice one at The Slaughtered Lamb, which was unexpected. I arrived really hungover, anticipating being an inconsequential musician in the corner. But it was full of people, a really nice venue and the audience were really attentive. I enjoyed playing #lobbylive for Jools' performance. That was actually a big crowd. I'd like to play for big crowds more often. Martin Lee Renshaw has been the principle songwriter for various bands and ensembles, the longest running of which was Phoenixdown from 2003 until 2011. Martin has been working on his solo project – From the Ashes – which is a 14 track concept album. Telling a dark yet colourful tale, the album features a wealth of exceptional musicians, collaborations, production and artwork. Listen to the music of Martin Lee Renshaw at Soundcloud or Pheonix Castle Productions by clicking here. Martin is playing at the first ever Late Night #LobbyLive after Frankie Boyle on Friday the 11th of March in the Forum at Watford Colosseum from 10:30pm. Martin will be playing new material ahead of Lucien’s Library Album release; he will be joined by the Late Day Breakers and Tom Craven. Tickets are available by invitation of the band with a limited amount available to book through the Colosseum Box Office at £2.50 per ticket. "In March, Watford Colosseum will celebrate the first anniversary of #LobbyLive," said Kerry. "We are delighted to have had the opportunity to enjoy the sounds of Watford's best and look forward to another year packed with local talent. Thanks to all performers we have had the pleasure to host this year and thanks to all audiences who have been part of the LobbyLive experience. We look forward to supporting many more artists this year and enjoying the Best of Watford sounds." To find out about upcoming #LobbyLive performances, check out thebestof Watford events listing by clicking here.